With more sales going through purchasing departments, you're bound to face price pressure on almost every opportunity. They'll expect you to discount. Nearly all organizations negotiate or discount their stated list price to some extent. In fact, in our Top-Performing Sales Organization study, we asked about the frequency in which companies discount. Results showed that only 7% of organizations never discount. 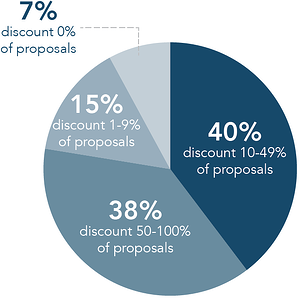 Approximately what percentage of sales opportunities does your organization negotiate or discount off listed price? Some companies, however, discount much less frequently than others. What characteristics are associated with companies that discount less frequently? Sellers in these organizations are also more knowledgeable in areas such as their industries and the market, their customers, their capabilities, the competition, and the company's best sales practices. When sellers have better prospecting and advanced consultative selling skills (such as inspiring buyers with new ideas) they are able to differentiate themselves, putting them in a better position to win. Higher differentiation means fewer and less attractive alternatives, which leads to leverage and premium pricing (or at least discounting less). We've outlined how and why this happens in our white paper, The Future of Consultative Selling. When sellers have better sales negotiation skills, they are less likely to fall victim to price pressure from buyers and more likely to negotiate agreements with more value, taking the focus off of price. When sellers develop executive-level relationships and drive account growth, they are often able to sole source opportunities, meaning there are fewer or no alternatives for the buyer, which tends to lead to less discounting. When sellers know more about their own industry, customers, capabilities, competition, and best sales practices, they can leverage that knowledge and drive value for the buyer. When they don't, the case for winning is not as strong and susceptible to discounting. When organizations have the skills to manage and coach sellers, not only do they discount less frequently, the depth of the discount is also lower. This is the only skill that significantly correlates to frequency and depth of discount. When sales managers have the skills to coach their teams to win opportunities, they can help their teams drive more value, focus on value over price, and focus on the opportunities most likely to bear fruit. When sellers and sales managers have the right skills and knowledge, they have a strong value case, which allows them to discount less frequently and puts them in the best position to drive sales wins—without discounting.